Speedy the cheeky house bunny: Easter Bunny Choices which one will you have this year! Easter Bunny Choices which one will you have this year! Next week is Easter weekend,and that means Bunnies so which type are you going to choose?Chocolate,Toy,or a real one? Our choice will be chocolate or a toy one! 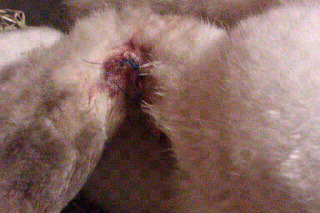 And this is why:After the first couple of weeks we had to get Speedy neutered.Then the first summer we had Speedy he had a fight with a cat in the garden which left him needing stitches the first costly incident. Before he had his surgery to fix him up. After he had his surgery to fix him up. 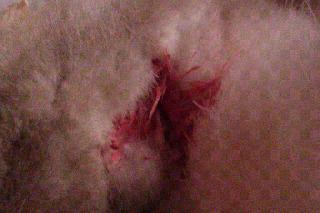 When we had Speedy a while we found out that he was born with glaucoma in his left eye,which later had to be treated with eye drops and painkiller which is costly when you have to to the vets every month for the eye drops and painkiller,later he developed an ulcer on the eye which we tried treating for about 3 months it didn't heal,which meant now a costly operation to remove it to give him his pain free quality of life back,he has also had 2 minor episodes of GI Stasis which luckily we was able to treat ourselves without going to the vet but he did have a reaction to an antibiotic injection which cause a bad GI Stasis episode last year it took several trips to the vet,lots of meds and 2 months of support feeding him with a syringe ,washing him and giving a couple of baths when he had diarrhea,being up all night long when he was really bad and then it took another month before he was fully back to normal, an eating pooping machine that mugs me for food.Had we not given him that care he would not be alive today,Scary isn't it? And this is him now! That a Fluffy cute animal like that can need so much hard work when they are ill never mind the work when they are healthy.So my advice is wait till you have done all the research and learnt all you can before you decide to bring a cute little bunny into your home and have a chocolate bunny or a soft toy bunny for Easter instead! Great post and well said and no worries we will stick with the chocolate variety. Have a super Saturday. Great reminders guys. I think that when rabbits get sick, they are actually a lot more "work" to care for. It's almost like having to feed a baby or something. You take great care of Speedy! I can only hope that all rabbits will receive that level of care. 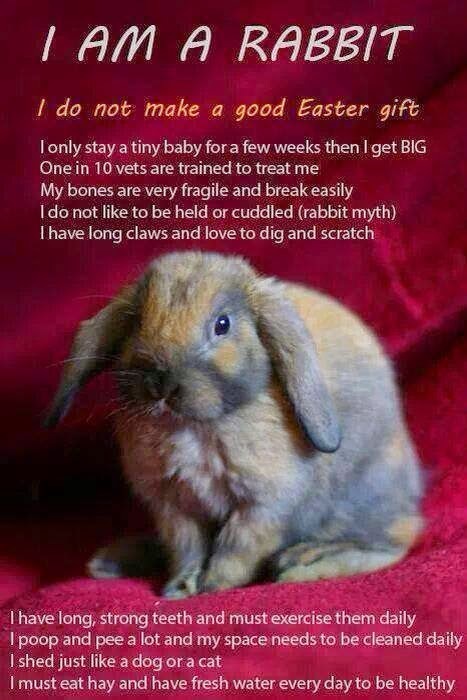 it's so true, rabbits are hard work, very rewarding and wonderful companions but hard work nonetheless. Speedy has gone through a lot hasn't he? Pawfect loving responsible mum and dad you lucky little fluff pot Speedy. LUVS YER TOO. Speedy, you and your hoomin Mummy are right. You bunnies are high-maintenance! You are very intelligent and full of personality and bunnitude, but only people prepared to invest time and work and understanding (and, yes, money) should have bunnies. Beery innsightfull post Lady Rachel an Speedy!!! LadyMum iss an advokat fur bunniess....shee talkss to peeple RITE INN THEE PET STORE an askss them seereuss questshunss bout bunnie care an health. When peeple reealzie just how much hard werk bunniess are they deecide maybee not such a good idea. Pee S: Fankss fur sharin thee eye fotoss'. Yur one handsum bunnie....one ey or 2...just like mee rite Speedy?? Yea...but we will bet you a dollar to a donut Speedy was worth it....cause he is to us...we love lookin at his movies.....Oh barharhar...and eating pooping machine and on top of that a Pirate Captain! Very well said indeed and we all love that Speedy! Thanks for spreading the word! Again!!!! Excellent post! We posted an article on Facebook why bunnies don't make good Easter gifts. We think you have excellent and caring humans, Speedy. Good job picking them out! Pee Ess - we're having chocolate bunnies! You have a heart of gold.. Taking such care with Speedy... Thank you for your insight to others about the responsibility of caring for a rabbit. We birds hide that week also. Very informative post. People often don't realize the responsibility involved in taking a new furry family member home. This is such an important message, Speedy! Bunnies are NOT low maintenance pets, and like any other family member, you have to be there for them for their whole life. It's a big commitment and never, ever to be taken lightly. Lucky bunny! You are in the right place at the right time. Mom says pets are a full-time job! Speed Boat, mi man! 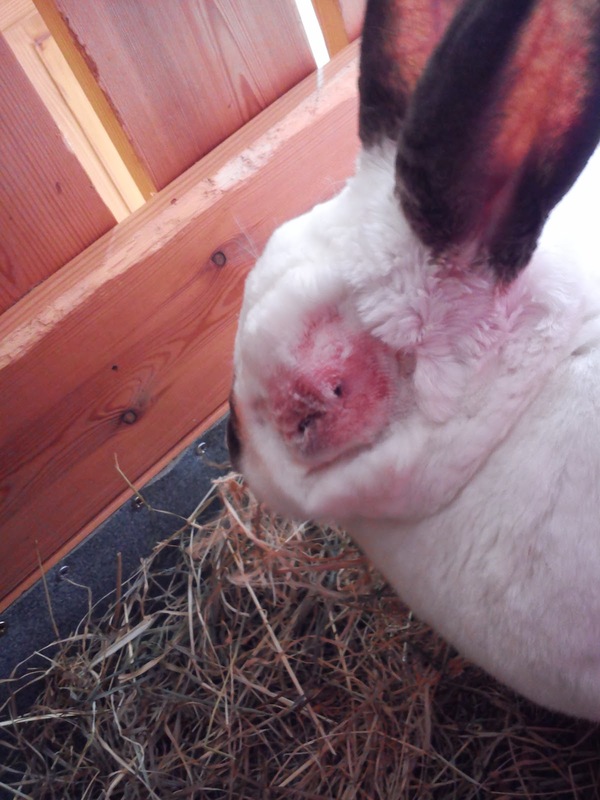 I think mummy did an excellent job of telling the truth about rabbit care. We always wanted a rabbit, but truth be told, we don't have the lifestyle or the time and money to properly bring up a healthy rabbit. For many of us who ADORE bunnies, the best thing is to admire them from a respectful distance. They deserve great care and YOU have devoted such a great part of your generosity, and Speedy is all the better for it because of you. HE IS SO HANDSOME, one eye or both. 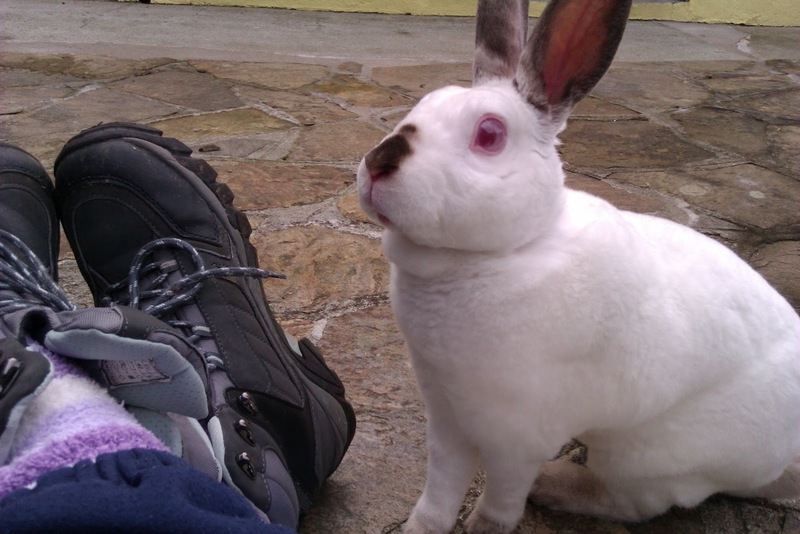 Lovely specimen (teeheee), GORGEOUS RABBIT! Love to you both! Oh we hope that people will opt for a candy bunny or stuffie instead of a real bunny because it's a "lifetime" commitment that not many people REALLY want to take on. It's not just a little cute baby animal for a day - it's a lifetime of care. I would love to have a cuddly stuffed animal of ANY kind for sure!!!!! 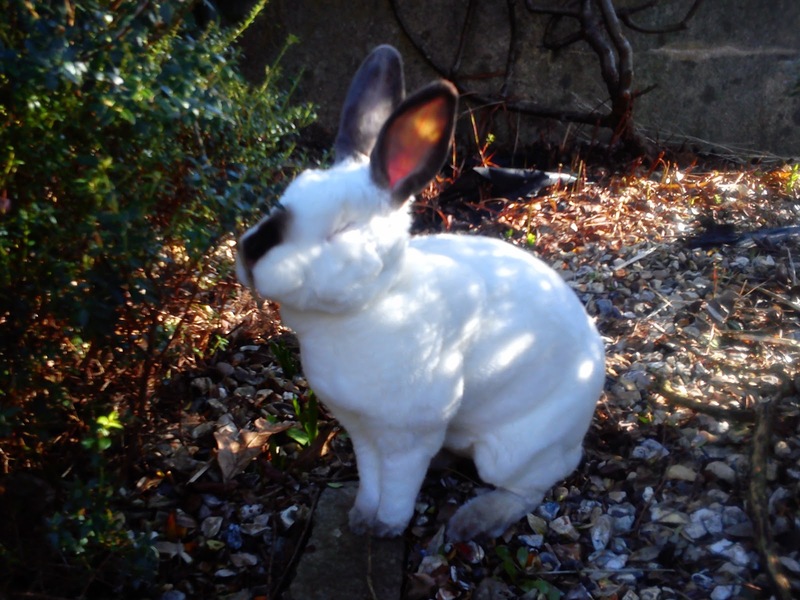 Speedy, I think you are in the very BEST home possible and I'm so happy you have a good life - you definitely are one lucky bun! This is a great post Speedy. We, animals, are not gifts. Never ! We think this is an important reminder to folks. Pets don't make good gifts. They are for life. Speedy, this is an important message, and we are going to share on our Facebook page. You are so lucky you have such great parents!